MedicStats is the easiest, and most affordable way to go mobile with existing electronic health records, and patient portals. With the patented MedicStats delivery system, through the use of individualized QR (quick response codes), we have created the most advanced, yet simplest method of connecting to any existing EHR, and delivering that information directly to the MedicStats cardholder. 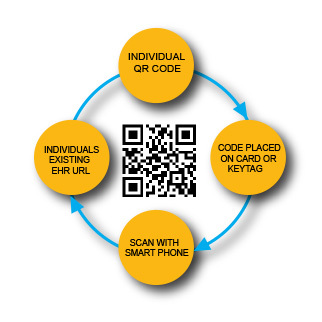 Each member/patient/customer is assigned an individual QR code and number, which is then placed on a card, keytag, and necklace, dogtag or bracelet. The QR code, when scanned with any smart phone, is then re-directed to the cardholder's existing EHR url, so the information contained there is automatically displayed on the cardholder's smartphone. All life saving medical information can be accessed and displayed immediately at any location, with any private information also available by entering a PIN from the smartphone or other Internet source. Each time the cardholder's medical information is updated in their patient portal of their central EHR, that information is transferred in real time to their MedicStats card, keytag and necklace, so their mobile access information is always current, and always in sync with their personal EHR. Think of MedicStats as a very advanced delivery system....delivering medical information 24/7, to any location with any smartphone.